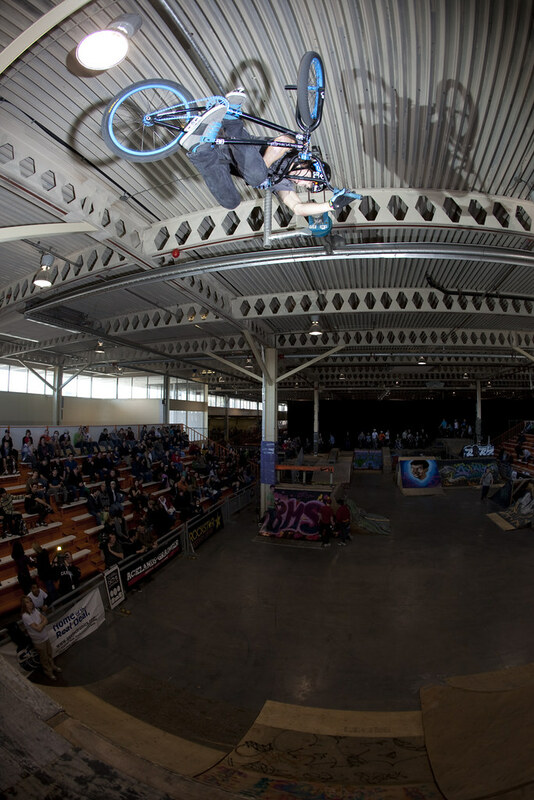 Words and Photos By: Mark Losey – For the fourth year in a row, Mike Heaton brought the BMX heavies to the Great White North for the annual Toronto BMX Jam. This year's course was tighter than years past, but once the pros hit the plywood, the size of the course became irrelevant. The setup was built around a wall of quarterpipes, a step-up, step-down, street spine, a sub rail, and a makeshift handrail. And every inch of the place got worked by the end of the weekend. 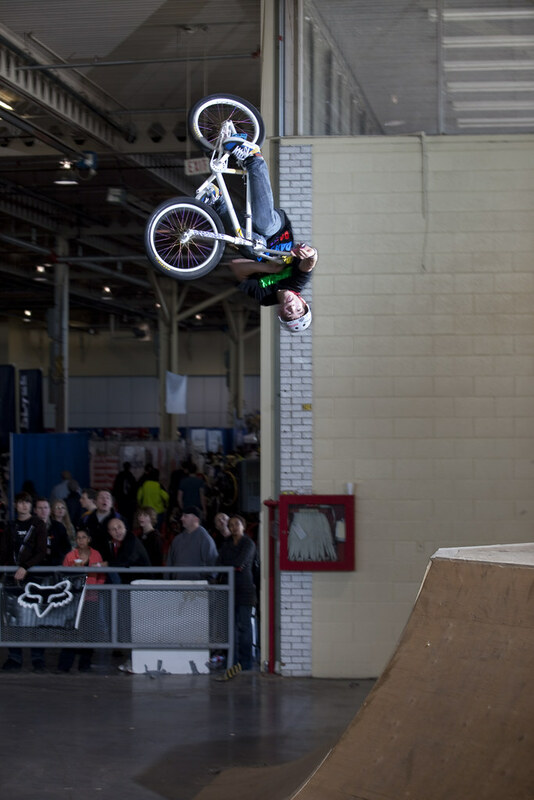 Canada should just get it over with and make Drew Bezanson Prime Minister. Typical contest reports count down to the winner, but we're going to cut straight to the human-highlight reel known as Drew Bezanson. Drew took a huge win at the Simpel Session in Estonia in January, and he backed that up with two mind-blowing web videos, so all eyes were on him in Toronto—and he did not disappoint. Drew is seriously on another level right now. During qualifying he wall-tapped over the judges out of a ten-foot quarter to start his run, and the bangers just kept flying. In the finals he even did a barspin-to-no-footed-can-can seven feet out of a ten-foot quarter. It looked like he decided to jump off, but of course he rode away with a smile and continued to destroy the place. At the end of the contest, he lived up to everyone's expectations when he icepicked the windowsill out of the ten-foot, and the second he landed a near riot exploded. All hail Drew B. 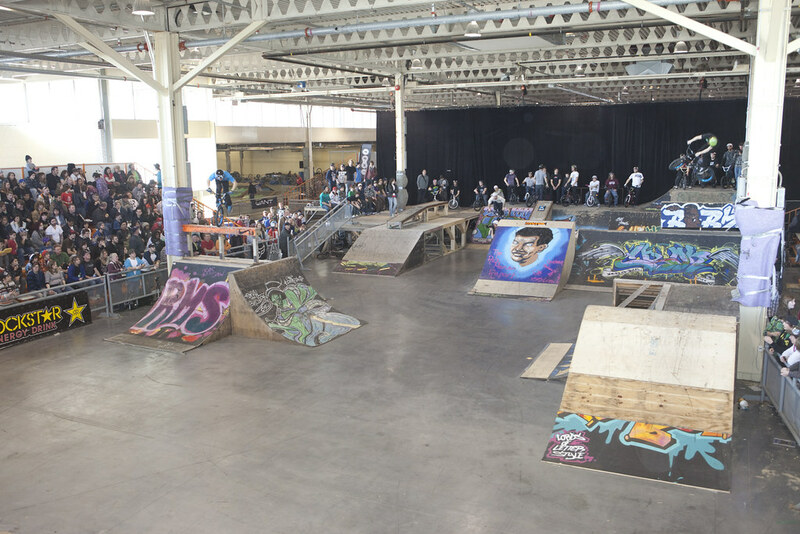 A look at the 2010 Toronto BMX Jam course. In the Spring these ramps get put on an ice skating rink in a city park so anyone can ride them and become the next Drew Bezanson. Third place belonged to Chris Hughes, who has been living in Greenville and coming through with big moves at every comp he hits. Chris had original lines throughout the course, and he spun two-900's before the day was over, just barely missing the roll out. You should expect big things from Mr. Hughes in 2010. Fourth place went to Mykel Larrin—think about that for a minute. Last season he qualified for the Dew Tour through the Gatorade Free Flow Tour, and now he scored fourth-place in a pro park contest! Mykel is for real. An alley-oop-no-hander across the chunk, his signature one-hander-one-footers and Griz airs, and a flip over the sub rail had everyone shaking their heads. Mykel Larrin, last year's Gatorade Free Flow Tour BMX Vert winner blasted the quarters in Toronto with his signature one-hand-one-footers and Griz airs. While the finals were incredible, two riders went down hard. 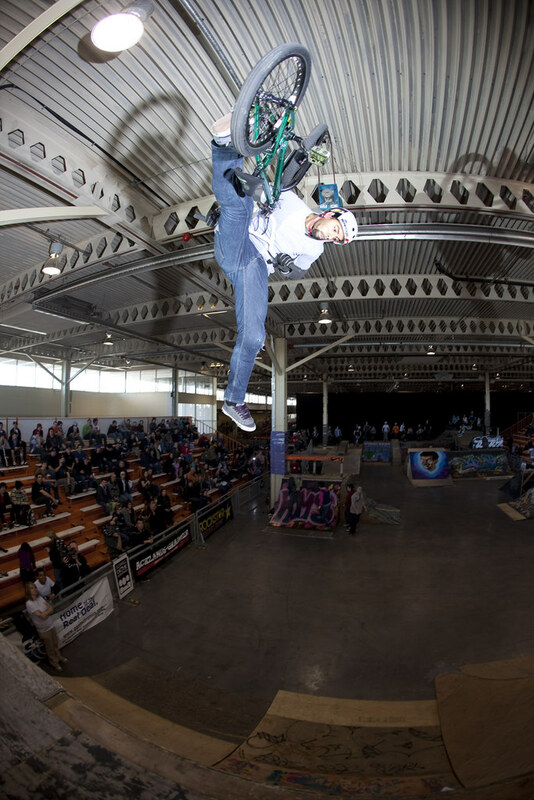 Zane Bradley, last year's Amateur winner, crashed hard on a tailwhip that took him out of the contest. Then Lil John went for a nose-bonk on a pillar during a 180 over the sub rail, and it resulted in a bad leg injury. It was somewhat in question whether the other riders wanted to keep riding after those two guys went down. In the end, they decided that the last thing Zane and Lil John would want was for the riding to stop because of them. When Drew stomped his incredible icepick at the end of the day, he said, "That was for Zane and Lil John." You can't stop the BMX.